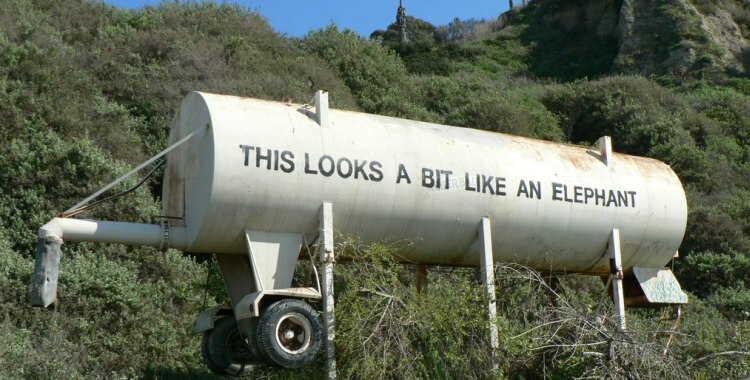 In February 2011, ever-elusive street artist Bansky spray-painted the words “this looks a bit like an elephant” on the side of a water tank in Los Angeles. This tank, abandoned up in the hills, had been a man’s home for the last seven years. Of course, as soon as word spread that there was a new Banksy work on the loose, art dealers quickly swooped in to remove it from its site, with hopes of making a tidy profit. The tank’s inhabitant was left homeless. It’s a good story. So it is hardly surprising that journalists quickly latched onto it, desperate to find out more about Tachowa Covington, the man who had made the water tank his home. Speculation spiralled around Covington’s life, his residence in the water tank, the circumstances of his eviction and the mysterious intentions of Banksy. One such article in the Independent inspired director Emma Callander, who asked Tom Wainwright to write a play about this series of events. So here was another story, and now that the piece arrives at the Arcola on its latest tour, it is joined by an additional piece in the jigsaw puzzle: Hal Samples’ documentary film Something From Nothing. I first saw Banksy: The Room in the Elephant at last year’s Edinburgh Fringe, armed with relatively little information about its intriguing subject. Wainwright, who has changed Covington’s name to Titus Coventry for the purposes of the play, has framed the tale within the fictional context of the water tank’s inhabitant telling his own story. Gary Beadle’s Coventry has broken back into the tank, now held in a secure warehouse in LA, and is recording a video of his version of events, with the intention of uploading it to YouTube. The show is careful throughout to remain playful in its handling of truth and fiction, inserting the storytellers into the tale and troubling the narrative it relates (if not always with a subtle hand). We are never entirely sure what to believe. There is an irony, as Wainwright admits, in becoming part of the “land grab” for Covington’s story at the same time as he implicitly critiques it. Essentially, this play is embarking on the same act of artistic and narrative appropriation committed by both Banksy and the journalists who followed in his wake. Its possible redemption, however, is in its insistent questioning of the stories we tell, how they are told, and who gets to tell them. It’s no accident that Wainwright’s script is drenched in borrowed Hollywood references; I’m reminded of Hannah Nicklin’s comment that capitalism has stolen our stories and is selling them back to us. Everybody here has a story, we are told of LA, but not everyone has the power or the platform to tell theirs. Covington, for one, seems to have been refused the right to his own story. With all of this in mind, it’s fascinating to watch the show a second time alongside Something From Nothing. The documentary actually pre-dates Banksy’s intervention; filmmaker Hal Samples had a chance encounter with Covington while in LA in August 2008 and began filming him and his eccentric home. After public interest in Covington exploded, Samples continued making the film, which goes on to chart its subject’s life post-Banksy and document his journey to Edinburgh to watch the play (to which he gave his blessing, before starting on some performing of his own). It’s an engrossing film, but watched through the lens of the preceding play it is seen with wary eyes. For all the assumed authority of the documentary form, this is still, unavoidably, just one part of the story. While Covington might get the chance to speak up and to share the work of art he made out of the water tank long before Banksy came along, his life is nevertheless seen once again from another’s perspective. Leaving the Arcola, interest freshly piqued by this extraordinary character and his attempt to live outside the structures of society, I still feel that I have seen the story, not the truth.